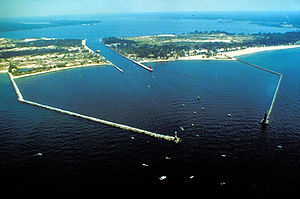 The 1000 foot freighter Indiana Harbor ran aground at the entrance to the Muskegon Channel which connects Lake Michigan with Muskegon Lake. The vessel was carrying coal to Muskegon, Michigan when it encountered shoals. The Indiana Harbor was able to be freed later the same day after unloading some cargo to a sister ship. The Reports state high winds caused sand to be push into the channel creating a sandbar.